Jared Cooper, Barron Associates, Inc.; Peter Thompson, Systems Technology, Inc.; Chase Schulze, System Technology, Inc; David Klyde, Systems Technology, Inc. Authors / Details: Jared Cooper, Barron Associates, Inc.; Peter Thompson, Systems Technology, Inc.; Chase Schulze, System Technology, Inc; David Klyde, Systems Technology, Inc. 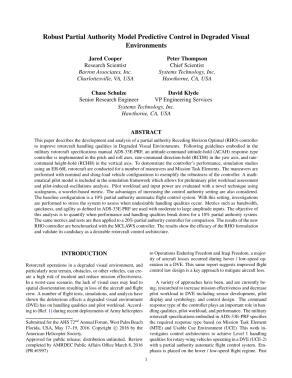 This paper describes the development and analysis of a partial authority Receding Horizon Optimal (RHO) controller to improve rotorcraft handling qualities in Degraded Visual Environments. Following guidelines embodied in the military rotorcraft specifications manual ADS-33E-PRF, an attitude-command attitude-hold (ACAH) response type controller is implemented in the pitch and roll axes, rate-command direction-hold (RCDH) in the yaw axis, and ratecommand height-hold (RCHH) in the vertical axis. To demonstrate the controllers performance, simulation studies using an EH-60L rotorcraft are conducted for a number of maneuvers and Mission Task Elements. The maneuvers are performed with nominal and slung-load vehicle configurations to exemplify the robustness of the controller. A mathematical pilot model is included in the simulation framework which allows for preliminary pilot workload assessment and pilot-induced-oscillations analysis. Pilot workload and input power are evaluated with a novel technique using scalograms, a wavelet-based metric. The advantages of increasing the control authority setting are also considered. The baseline configuration is a 10% partial authority automatic flight control system. With this setting, investigations are performed to stress the system to assess when undesirable handling qualities occur. Metrics such as bandwidth, quickness, and agility as defined in ADS-33E-PRF are used with moderate to large amplitude inputs. The objective of this analysis is to quantify when performance and handling qualities break down for a 10% partial authority system. The same metrics and tests are then applied to a 20% partial authority controller for comparison. The results of the new RHO controller are benchmarked with the MCLAWS controller. The results show the efficacy of the RHO formulation and validate its candidacy as a desirable rotorcraft control architecture.